The first round of the Cape Boulder League kicked off last night and the turn-out was excellent. 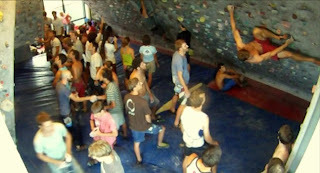 Over 50 competitors crammed into the sports hall at UCT to battle it out on 15 problems for 3 hours. The mens open field saw a 3 way tie on the night with Jimbo Smith, Robert Fraser and Marijus Šmigelskis sending problem 13. The ladies open was won by Julia Chen, who managed the only female send of the dynamic problem 6. Thanks to Calvin Kemp for organising the start of another promising comp season! Thanks Calvin for organising and all the route setters who set the problems!! it's gonna be a good season! I wanna climb there too!!! Good luck everyone. Much respect to all involved.